It’s a Maisto. But I can’t call this one cheap. 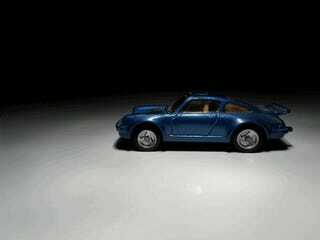 It has working suspensions and feels as good in your hand as a standard Hot Wheel, Matchbox, or Tomica. Actually a little better than Tomica once you consider the wheel design. Now here are some dusty photos of it. I don’t remember when I got this or where it came from. All I know is I’ve had it for at least a decade. And here’s photo of it sitting next to some random objects. Because Rennsport.